﻿ Fibre optics: how communication has evolved over the years!! The Divine Comedy is probably the first book that comes to mind to italians and not; an epic poem of almost 92,000 pages and about half a million characters. Imagine now to put them all in a simple Word file. 8 bytes (1 bit) for each character, it will make about 500000 bytes, corresponding to 0.5 MB . How much time do we need to send by mail the Divine Comedy? Of course, it depends of the connection speed that you have available on you device. The connection speed is measured in number of bits transmitted per second (bps), with its multiples Mbps, Gbps and Tbps respectively for a million, a billion and one trillion of bits per second. Thirty years ago, when the data rate was of 300 bits per second, to send this file almost 4 hours were needed, while with the current speed it will take only 0.13 seconds! Due to the developments over the last years on equipment and network protocols, the transmission rate has increased exponentially. We went from the old analog modems back to the 80s (with data rate of 300 bps) unitll the modern digital transmission techniques such as the ISDN in the late 80s (with data rat of 56,000 bps), and the DSL, created fifteen years ago, able to transmit data at houndreds of megabits per second. 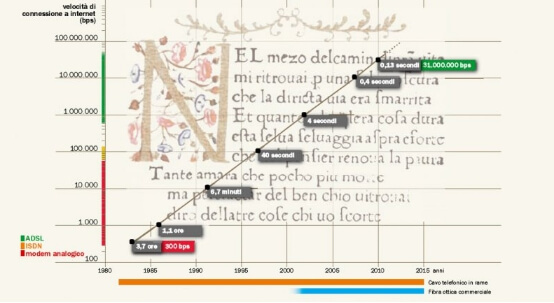 Figure 1 - Time needed to send, via email, the entire Divine Comedy, from the 1985 till today today. As already said, an important boost to the increasing of the data rate was given by the new communication "channels". The old telephone cable terminated in all our apartments, was replaced almost everywhere by optical fibers. Optical fibres represent the brick to build up the new "highways", connecting continents through the oceans and making possible simultaneous communications among millions of people with transmission rate of tens of millions of Mbps. Optical fibres carry almost the totality of traffic data, making the satellites play a marginal role. The history of intercontinental communications is old and complex (see http://atlantic-cable.com/). The first cable between England and the US was laid back to 1858. The British warship HMS Agamemnon and the American Uss Niagara met in a middle point of the Atlantic, where the two halves of the transatlantic cable were connected (for a total cable length of almost 3000 km). Once the connection was done, the two ships turned away laying gradually down the submarine cable on the ocean floor, reaching the shore of Ireland (on the east) and the island of Newfoundland (on the west). Triumphal celebrations followed that day and the 16th of August 1858 the first transoceanic "email" of the history run through this cable. Queen Victoria sent a telegram to the President of the United States, James Buchanan, to congratulate of the excellent job. This message, less than 100 words and about 500 bytes, took about 17 hours and 40 minutes to get to destination! Today, from Buckingham Palace to the White House, the message would have arrived at its destination after a few milliseconds (due to the non-infinity speed of light signal propagating inside the optical fibers). Unfortunately, the life of the first transatlantic cable was quite short. To make up for the weak Morse signal, the supply voltage was increased too much breaking irreparably the cable in two parts . 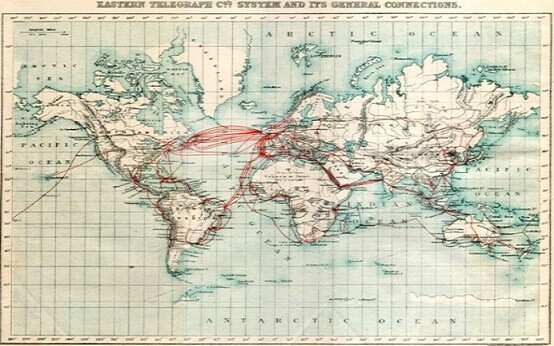 However the embarrassing failure of the 1858 did not stop the expensive dream of building a transoceanic network. The push towards progress (and all the business interests) make quickly forget the shock of the first failure, and of the many others that have followed it. In the 1866 a new cable was suffessfully pulled between the two countries. Due to the improved quality of the cable (i.e. a better water insulation of the hose) the cable worked for many years, opening a new era for the comunication. In fact, just forty years after the first attempt, the world was already equipped with its own "nervous system" (see Figure 2). Fig 2. Map (1901) of the transoceanic and transcontinental network. Since that moment, many progresses have been made, especially with the introduction of submarine fiber optic cables. From 1988 to the 2000 all the copper cables were completely replaced by optical fibres. The last submarine fiber optic cable was installed in 2013. The Hibernia Express, this is the name of the new cable is providing to a few highly selected users (at a high price), a reduction of the data transmission time of about 5 milliseconds, reducing the comunication time between London - New York - London from the current 65 to 60 milliseconds It would look like a small improvement and an unwise investment (almost 300 million dollars), but it is not. For the fast computer of the London Stock Exchange it will be very remunerative to know the stock prices of Wall Street 5 milliseconds before any other competitor.